December 1915 – The 60th Battalion C.E.F. "Victoria Rifles of Canada"
Canadian Corps Headquarters received authorization to form a 3rd Canadian Division consisting of the 7th, 8th and 9th Brigades. 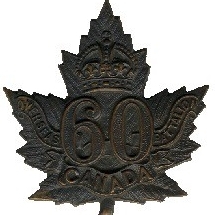 The 60th battalion was to be part of the 9th Brigade, along with the 43rd “Cameron Highlanders” from Winnipeg, The 52nd “New Ontario” Battalion from Port Arthur, and the 58th “Central Ontario” from Niagara on the Lake.